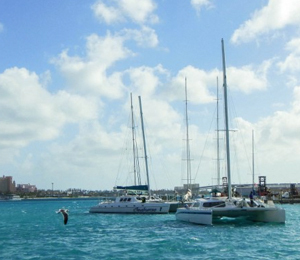 The Seahorse Sail and Snorkel package is one of Nassau’s most highly rated snorkeling excursions. When it comes to straightforward but unforgettable snorkeling, this tour takes the cake. Sailing out to sea on a large, spacious and modern sailing catamaran, the Seahorse Sail and Snorkel excursion brings together the joy of sailing with the thrill of snorkeling at a living coral reef. If you go on any boat in the Bahamas, it better be a sailboat! And if you do one excursion in the Bahamas (other than Bahamas scuba diving, of course! ), it has to be snorkeling at the coral reef! Snorkeling in the Bahamas has become the nation’s favorite pastime for both locals and visitors alike. Just a few miles off the coasts of New Providence Island is a large and expansive stretch of living coral reef. This coral reef ecosystem houses countless marine species. When you snorkel at the coral reef in the Bahamas, you will be snorkeling alongside all kinds of multi colored reef fish such as the angelfish, parrotfish, and butterflyfish. But you are also likely to see some of the other usual residents of the reef including small lobster, eel, stingrays, and even turtles! Snorkeling is fun and easy for the whole family! Even if you have never tried snorkeling before, our professional team and crew on board will show you just how to use your mask, fins, and snorkel. Before you even know it, you will be swimming at the surface of the clear-blue waters as you stare in awe at the magical wonderland beneath you! After about an hour or more of snorkeling, you get to relax on the boat and take in the warmth and beauty of the Bahamas. We will provide you with a delicious complimentary rum punch to help with the relaxation. You will sit back and realize, the Bahamas truly do feel like Paradise. What is included in this activity? This activity includes your snorkeling equipment, instruction and one complimentary rum punch per person. If the activity must is cancelled due to bad weather, and you cannot reschedule, you will be issued a full refund. Bahamas Dive Center is always interested in your tour experience with us. We hope you enjoyed your tour and love to hear comments. I have been to the Bahamas many times, but Seahorse Sail and Snorkel is one of my favorite trips! It includes everything that everyone should do here. As a Bahamas veteran, I can say only the best about this experience!